The McCracken Research Library at the Buffalo Bill Center of the West suggests the following bibliography for further reading on William F. Cody. Barnes, Jeff. The Great Plains Guide to Buffalo Bill: Forts, Fights & Other Sites. Mechanicsburg, PA: Stackpole Books, 2014. Blackstone, Sarah J. The Business of Being Buffalo Bill: selected Letters of William F. Cody, 1879-1917. NY: Praeger, 1988. Bonner, Robert. William F. Cody’s Wyoming Empire: The Buffalo Bill Nobody Knows. Norman: University of Oklahoma Press, 2007. Bridger, Bobby. Buffalo Bill and Sitting Bull: Inventing the Wild West. Austin: University of Texas Press, 2002. Buffalo Bill and the Wild West. The Brooklyn Museum [and] Museum of Art, Carnegie Institute, Buffalo Bill Historical Center; exhibition sponsored by Philip Morris and the Seven-Up Company; Brooklyn, NY: Brooklyn Museum; [Pittsburgh, Penn. ]; distributed by University of Pittsburgh Press, 1981. Burke, John M., and Chris Dixon. Buffalo Bill from Prairie to Palace. Lincoln: University of Nebraska Press, 2012. Carter, Robert A. Buffalo Bill Cody: The Man Behind the Legend. NY: Wiley, 2000. Cody, Aldus Morrill. Phillip and Martha: their Sons and Daughters: The Cody Family in North America. [n.p. ]: The International Cody Family Association, 1986. Supersedes previous works published in two parts in 1981 and 1982 with variant subtitles. Cody, Louisa Frederici, in collaboration with Courtney Ryley Cooper. Memories of Buffalo Bill. NY: D. Appleton and Co., 1919. Cody, William F. The Life of Hon. William F. Cody Known as Buffalo Bill the Famous Hunter, Scout and Guide: An Autobiography. Hartford, CT: Frank Bliss, 1879. Republished under various titles and in various editions. Recommended modern edition is by University of Nebraska Press in 2011, edited by Frank Christianson. Foote, Stella. Letters from “Buffalo Bill.” El Segundo, CA: Upton & Sons, 1990. Friesen, Steven. Buffalo Bill: Scout, Showman, Visionary. Golden, CO: Fulcrum, 2010. Hedren, Paul L. First Scalp for Custer: The Skirmish at Warbonnet Creek, Nebraska, July 17, 1876: With a Short History of the Warbonnet Battlefield. Lincoln, NE: University of Nebraska Press, 1980. Jonnes, Jill. Eiffel’s Tower: and the World’s Fair where Buffalo Bill Beguiled Paris, the Artists Quarreled, and Thomas Edison became a Count. New York: Viking, 2009. Kasson, Joy. S. Buffalo Bill’s Wild West: Celebrity, Memory and Popular History. NY: Hill and Wang, 2000. Leonard, Elizabeth Jane and Goodman, Julia Cody. Buffalo Bill, King of the Old West (1955).Kissimmee, FL: Cody Publications Inc., 1978. Robison, Nancy. Buffalo Bill. New York: Franklin Watts, 1991. Rosa, Joseph G., and Robin May. 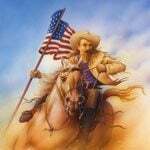 Buffalo Bill and his Wild West: a Pictorial Biography. Lawrence: University of Kansas Press, 1989. Russell, Don. The Lives and Legends of Buffalo Bill. Norman: University of Oklahoma Press, 1960. Recommended. Sagala, Sandra. Buffalo Bill on the Silver Screen: The Films of William F. Cody. Norman: University of Oklahoma Press, 2013. Scott, Douglas D., Peter Bleed, and Stephen Damm. Custer, Cody, and Grand Duke Alexis: Historical Archaeology of the Royal Buffalo Hunt. Norman: University of Oklahoma Press, 2013. Sorg, Eric V. Buffalo Bill: Myth and Reality. Santa Fe, NM: Ancient City Press, 1998. Walsh, Richard J., in collaboration with Milton S. Salsbury. The Making of Buffalo Bill: a Study in Heroics. Indianapolis: Bobbs-Merrill Co., 1928. Warren, Louis S. Buffalo Bill’s America: William Cody and the Wild West Show. New York: Alfred A. Knopf, 2005. Recommended. Wetmore, Helen Cody. Last of the Great Scouts: The Life Story of Col. William F. Cody “Buffalo Bill”. Duluth and Chicago: The Duluth Press Publishing Co/The Lakeside Press, R. R. Donnelly and Sons, 1899. Republished as Last of the Great Scouts (Buffalo Bill) by Helen Cody Wetmore and Zane Grey, NY: Grosset & Dunlap, 1918. Written by William F. Cody’s sister. Winchester, Juti. “All the West’s a Stage: Buffalo Bill, Cody, Wyoming and Western Heritage Presentation, 1846-1997.” Thesis (Ph.D.) Northern Arizona University, 1999. Wojtowicz, James W. The W. F. Cody Buffalo Bill Collector’s Guide with Values. Paducah, Kentucky: Collector Books, 1998. Yost, Nellie Snyder. Buffalo Bill: His Family, Friends, Fame, Failures, and Fortunes. Chicago: Sage Books, Swallow Press, 1979. Compiled by the McCracken Research Library. Updated August 2016.